David Bowie’s A Reality Tour is an extensive live and final overview of his greatest hits, popular album tracks, along with artist and fan favorites, performed live during his amazing performance in Dublin, Ireland. The 2004 show was captured on film for DVD, later on CD, but never released on vinyl. 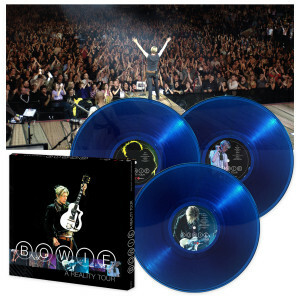 Friday Music being a home to several of David Bowie’s later masterworks like Heathen, Reality, Earthling, Outside, and Hours, we are very honored to announce for the first time anywhere the 180 Gram Audiophile 3 LP Box Set of his final concert tour recordings A Reality Tour. Featuring almost three hours of music on six sides of audiophile vinyl, the songs are simply some of his finest from the classic and modern rock eras like Heroes, Ziggy Stardust, Changes, Fame, Under Pressure, All The Young Dudes, Rebel, Rebel and many more. Mastered impeccably by Joe Reagoso at Friday Music and Capitol Mastering, this limited edition release will be housed in a very handsome sturdy box, with two first time poster inserts featuring the wonderful 12” x 12” front cover image as well as a 12” x 24” double-sided poster featuring unique live performance shots from this great concert tour. For a very limited time, each LP will be pressed by R.T.I. on translucent blue vinyl, making A Reality Tour a highly collectable David Bowie title. Each LP label will have its own custom David Bowie image, plus we are including 3 bonus tracks only found on the CD version of the original release China Girl, Fall Dog Bombs The Moon and Breaking Glass. David Bowie was one of the world’s finest gifts to all forms of popular culture, music, film and art. His voice, songs, musicianship and unparalleled artistry will live on. A Reality Tour proves that now and forever.